Hungarian rabbi and author; born at Nadas Jan. 23, 1815; died at Tyrnau Dec. 18, 1891. His father came from Kanitz in Moravia, wherefore he signed himself "Simeon ," in which the latter name was misread by Steinschneider ("Cat. Bodl." col. 2612) as "Konitz," and by Löw ("Lebensalter," p. 92) as "Kunitz." He studied at the yeshibah of Moses Sofer, and on settling in his native city opened a yeshibah there. In 1845 he was elected rabbi of Cziffer, Hungary, and in 1856 of Tyrnau, which latter position he held until his death. Strictly conservative, he was tolerant of modern ideas, and in 1860 he sent his son to the seminary of Breslau, although he encountered considerable opposition for doing so. Sidon wrote "Ot Berit" (Presburg, 1850), on the laws governing circumcision, proselytes, and the redemption of the first-born; and "Shebeṭ Shim'on" (Vienna, 1884-88), a work in three parts, the first part containing notes on Yoreh De'ah and Eben ha-'Ezer; the second, sermons delivered on special occasions; and the third, novellæ on various treatises of the Talmud. He also edited Manoah ben Jacob's ritual work "Sefer ha-Manoaḥ," to which he wrote a commentary entitled "Bet Menuḥah." 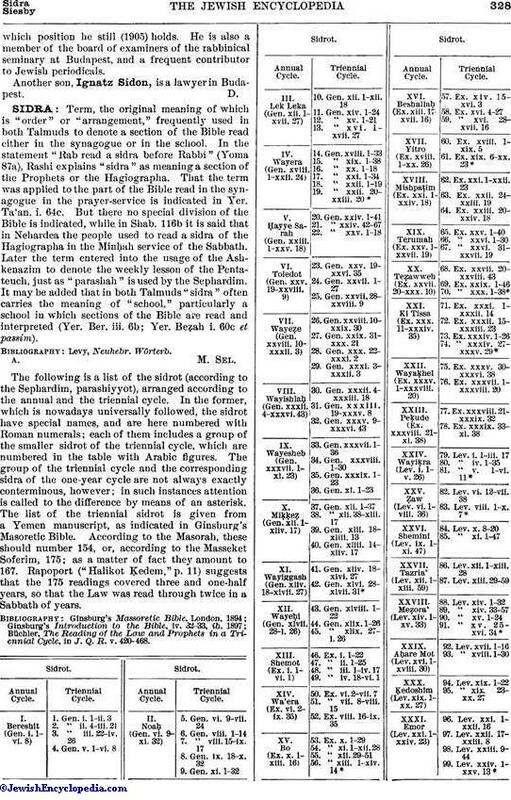 After his death appeared his commentary on the Pesaḥ Haggadah (Munkaes, 1901), edited by M. Stein under the title "Shebeṭ Shim'on." 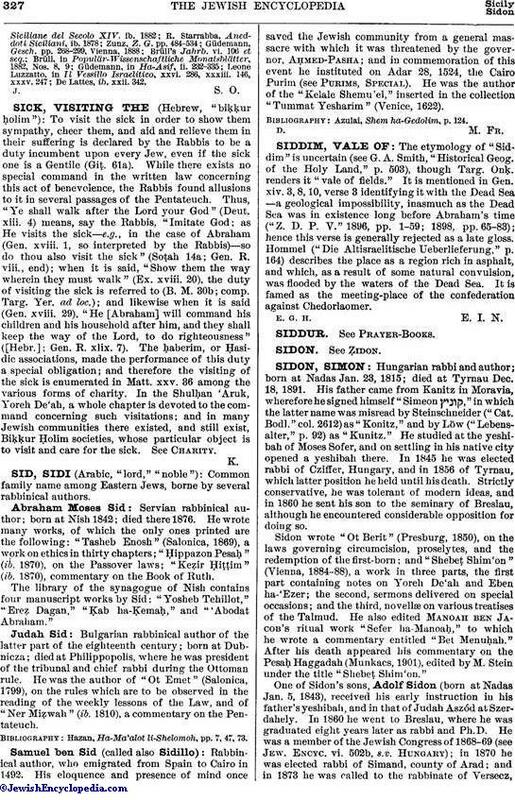 One of Sidon's sons, Adolf Sidon (born at Nadas Jan. 5, 1843), received his early instruction in his father's yeshibah, and in that of Judah Aszód at Szerdahely. In 1860 he went to Breslau, where he was graduated eight years later as rabbi and Ph.D. He was a member of the Jewish Congress of 1868-69 (see Jew. Encyc. vi. 502b, s.v. Hungary); in 1870 he was elected rabbi of Simand, county of Arad; and in 1873 he was called to the rabbinate of Versecz,which position he still (1905) holds. He is also a member of the board of examiners of the rabbinical seminary at Budapest, and a frequent contributor to Jewish periodicals. Another son, Ignatz Sidon, is a lawyer in Budapest.